Join Dr. Fox in fight against arthritis, regsiter or donate today! Dr. Tina Shah, a rheumatologist at the Center for Rheumatic Disease, is delighted to be the Medical Honoree for the Walk to Cure Arthritis this year! She is a native of Kansas City and attended the University of Missouri-Kansas City BLA/MD program. Subsequently, she attended internal medicine residency and rheumatology fellowship at George Washington University Hospital in Washington, D.C. She was an assistant clinical professor of rheumatology at GWU, where she taught musculoskeletal ultrasound to residents and fellows to evaluate arthritis. She is overjoyed to return to her hometown to practice rheumatology. She adores her patients and appreciates the opportunity to really get to know them and understand how arthritis is affecting their lives. "It is always a pleasure to see patients exceed their expectations with their arthritis and enjoy their active lifestyles." She appreciates the opportunity to ameliorate a patient's joint pain and function by nonpharmacologic and pharmacologic modalities. She hopes that with ongoing research and medical advances, rheumatologists can have more tools to evaluate and treat many different types of arthritis. She would like to remind us all, "there are over 90 different types of arthritis, and we have a long way to go, to cure arthritis." 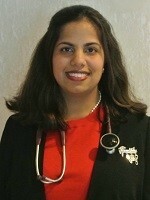 Dr. Shah sees patients in the Northland Kansas City area. She enjoys traveling, reading, and spending time with her two children. She hopes her involvement in the Walk to Cure Arthritis will help others to also be able to live full lives. Join Dr. Shah in the fight against arthritis, register or donate today! 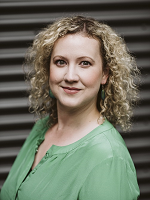 Tess, now 25, was diagnosed with rheumatoid arthritis (RA) at the age of 15. At the time she was an avid runner, team captain of her cross country team and in a total of three sports a year. She then moved from Arizona to Kansas for college to pursue her passion and become a registered nurse. She was first an RN in rheumatology and is now a Clinical Quality Abstractor at Children’s Mercy Hospital. As a child one does not think that they are anything but invincible. Until you stare adversity in the face, you do not realize how fragile life can be. Growing up Tess’s father would say, “pleasant persistence pays dividends.” It was not until after she was diagnosed with RA did she realize how important this phrase would become. There have been many arduous and albeit painful times throughout the course of her diagnosis, but it is at these times that she would hear her father’s words ringing in her ears. She has learned that she cannot control everything, but that she can make the best out of each situation. It is through “pleasant persistence” that she has been able to accomplish her achievements thus far and has provided her with the motivation and determination to keep going. RA is one of the most difficult things she has had to face and her positive outlook and determination to overcome enables her face whatever life throws her way head on. Tess is very honored to have been able to become more involved with the Arthritis Foundation over the past year and especially honored to be chosen as a Walk to Cure Arthritis Honoree. Join Tess in the fight against arthritis, register or donate today! Corbin was diagnosed shortly after her 2nd birthday with oligoarticular juvenile idiopathic arthritis in her right knee and both ankles. It all started with a limp and eventually, Corbin couldn’t support her own weight. Corbin spent a few weeks crawling everywhere she wanted to go, or just sitting in a chair while her friends played at school. Thankfully, her pediatrician got her into the rheumatology clinic quickly. Since her diagnosis three years ago, Corbin has been receiving 1-2 weekly injections, gone to dozens of doctors appointments, and had blood drawn more times than she can count. She has struggled with anxiety surrounding her shots since day one, from vomiting within seconds of the shot to trying to refuse and fight the shots (and her parents). Along with all the struggles, Corbin has officially had “no active arthritis” for one full year now! Corbin and her family have met wonderful people in the JIA community thanks to Arthirtis Foundation Family Days, along with the incredibly supportive staff at the Arthritis Foundation. 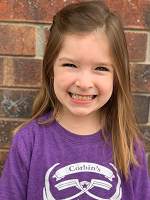 Corbin is hopeful that there will one day be a cure for her and fellow arthritis warriors and is excited to be able to help by raising money and spreading her story: that kids get arthritis too! Join the fight against arthritis, regsiter or donate today! Emma was diagnosed with juvenile idiopathic arthritis at the age of 2. She was a spunky two-year-old girl who woke up each morning and could barely walk. 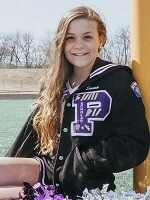 She spent most of her early years inevitably picked last for any competitive activity at school and despite her parents’ valiant efforts for her participation in youth sports, the excruciating pain in her knees and ankles sidelined her from being able to compete. 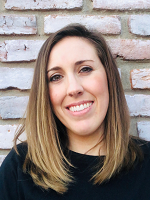 Emma struggled with swallowing pills and years of trial and error with ineffective oral prescription combinations, injections, MRI’s, and outpatient surgeries. First, sub cue injections that came with the piercing pain of long needles going into her belly, and an awful metal taste that lingered in her mouth hours after. At last, she was eligible for “step therapy,” an IV drip medication, that actually worked to reduce her inflammation. By this time, she was seventeen and after a few months of treatment, there were no active signs of arthritis, but the damage had been done. The loss of cartilage in her knees was irreversible. Emma went from being an insecure, quiet little girl that was categorized as different for most of her life to becoming an optimistic and determined young woman thanks to a pivotal moment of serving as a counselor at Arthritis Foundation’s Camp Joint Adventures. That inclusive environment changed the trajectory of her life where it sparked her interest in advocating for younger versions of herself. Emma has been accepted into the honors program at Midland University in Fremont, Nebraska. She will pursue a degree in Communications with an emphasis in Philanthropy and will have the opportunity to cheer collegiately. She hopes to use both platforms to leave a legacy through a non-profit organization like the Arthritis Foundation that can cultivate positive change for the underdogs like her. Join Emma in her fight against arthritis, register or donate today! Ryker Adams was diagnosed with juvenile idiopathic arthritis in November of 2017 at the age of 6. His family first noticed a problem when one of his knees became very large, and he was having a hard time walking on it. Ryker visited his pediatrician, and soon after was sent to Children’s Mercy. It was there he learned that he had several other joints affected as well. Having arthritis can be hard on Ryker because the pain that comes with arthritis. He sometimes has to miss school. Ryker struggles with feeling different than all of his friends, and he realizes they really don't understand what he is going through. Even though he has arthritis Ryker can usually run and play like all the other kids. Ryker is probably proudest of the fact that he has been able to keep playing baseball. He plays year-round on a competitive team, and loves playing third base. 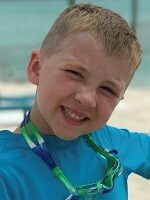 This is Ryker’s second year participating in the Walk to Cure Arthritis. He has also attended the JA Symposium at Union Station and the JA day at Faulkner’s Ranch this past fall. Ryker is thankful to be one of this year’s honorees, because he gets the chance to educate others on what it is like to live with this disease.